And its currency has lost 35% of its value over the past two years. For most folks, this sounds like a market to avoid. But for Casey Research founder Doug Casey, it sounds like a promising money-making opportunity. Longtime readers know Doug made millions buying assets most investors wouldn’t go near. He literally wrote the book on how to make money investing in hated markets. Brazil is the world’s fifth most populous country. It has the world’s eighth biggest economy. Not long ago, it was a rising star of the global economy. Its economy more than quadrupled in size from 2000 to 2011. Brazil was even the “B” in “BRICS,” a Wall Street acronym for five emerging markets with big growth potential. But it didn’t live up to the hype. Its economy hasn’t grown since 2010. To put that in perspective, the U.S. economy has only had two down years since 1992, when it shrunk during the 2008–2009 financial crisis. Brazil’s stock market and currency have also tanked. Inflation in Brazil is above 10% for the first time in 12 years. Unemployment is at a six-year high and rising. Brazil’s socialist president, Dilma Rousseff, is a big reason the country’s economy imploded. Five years into her presidency, Brazil’s finances were in shambles. The country went from a 2.3% government surplus in 2011 to a 10.3% deficit last year. Rousseff is still in office right now. But she may not be for long. She’s currently standing trial for impeachment. Many folks are hopeful a new government can turn things around in Brazil. • Nick Giambruno, editor of Crisis Investing, has been following Brazil closely for months…. As you may know, Nick is Doug’s globetrotting companion. His investing style is similar to Doug’s—he buys cheap markets and industries other investors run away from. In 2013, Nick used this strategy to make huge gains investing in the tiny European island of Cyprus. The country just had a horrible banking crisis. Its stock market was down 98%. It was one of the world’s most hated markets. Nick recommended eight dirt-cheap Cyprus stocks to his readers. One of those stocks tripled in less than two years. Two doubled over the same period. Another gained 97%. He’s not a buyer yet. As bad as things are in Brazil right now, Nick says things will get worse. Brazil’s main stock index, the Bovespa, jumped 45% from the end of January to the end of April. [T]he only buyers of Brazilian equities the last few months were foreigners. Local investors have been selling. Nick knows that it pays to watch who’s buying and who’s selling. In this case, the locals are selling. Locals have a front-row seat to the action. If they’re selling, that probably means things are getting worse. Replacing one corrupt government with another is not going to fix these problems. The worst is yet to come in Brazil. It’s shaping up to be a lovely train wreck. That might sound like a bold prediction. But keep in mind, Brazil’s had five currency crises in the past 75 years. That’s one every 15 years. The last one was in 1994. According to Nick, Brazil is long overdue for a currency crisis. That’s when he’ll pick up shares of the world-class Brazilian company on his watch list. The company dominates its industry and is ultra-efficient. It’s also grown its profits by an average of 13% every year since 2010 despite Brazil’s economic downturn. 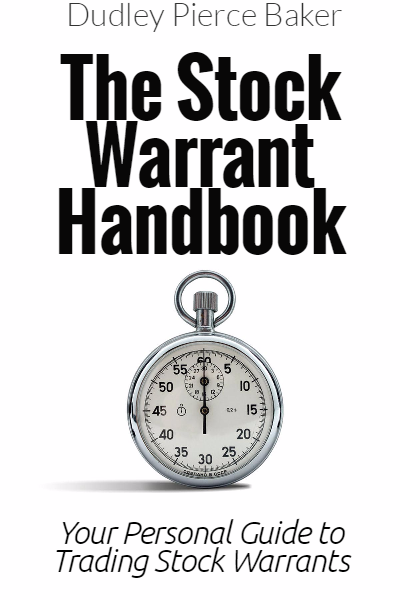 He will let his Crisis Investing readers know when it’s time to buy. Nick told readers how to bet against Brazilian stocks in April. His timing was spot on. Last month, the Bovespa plunged 10%. According to the Financial Times, it was the world’s worst-performing stock market during the month of May. Nick’s bet against Brazilian stocks paid off big. It returned 25% in just over a month. If you didn’t get in on this trade, don’t worry. As we said, Nick thinks Brazilian stocks are headed much lower. In April, Nick said “a 300% gain is a reasonable target” for this trade. You can invest alongside Nick—and learn exactly how to profit from Brazil in the coming months—with a subscription to Crisis Investing. By clicking this link, you can sign up for a risk-free trial. You’ll also get a chance to watch a short video about a much bigger crisis on Nick’s radar…and how to profit from it. Click here to view this free video. Today’s chart shows the performance of the Bovespa, Brazil’s version of the S&P 500, since 2000. 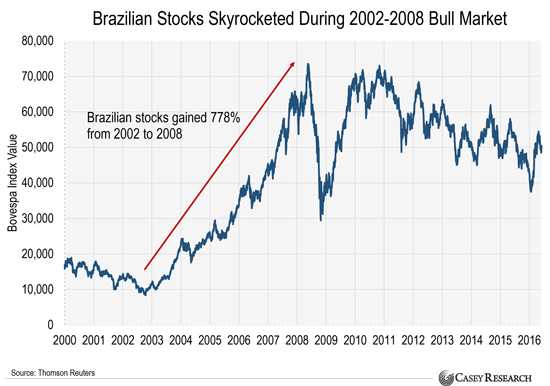 You can see Brazilian stocks began a huge bull market about fourteen years ago. The Bovespa gained 778% from 2002 to 2008. For comparison, the S&P 500 has gained 211% since its historic bull market began in 2009. In 2008, Brazilian stocks plunged when the global financial crisis hit. They never fully recovered. Nick thinks Brazil’s current economic crisis will send stocks even lower. This could set up a buying opportunity like we saw in 2002. The article How to Make 300% Gains in This Beaten-Up Market was originally published at caseyresearch.com.